POLITICAL TIDBITS: DRAMATIC REJECTION OF GINA LOPEZ IN CA VOTING, WHICH NOBODY COULD PREDICT, GIVEN NOMINATION'S CLIFF-HANGER STATUS. DUTERTE CABINET SPLIT ON GINA, AND IN THE END DIGONG WAS FORCED TO GIVE HER UP. GINA A SHOO-IN FOR THE SENATE NEXT ELECTIONS. DRAMATIC REJECTION OF GINA LOPEZ IN CA VOTING, WHICH NOBODY COULD PREDICT, GIVEN NOMINATION'S CLIFF-HANGER STATUS. DUTERTE CABINET SPLIT ON GINA, AND IN THE END DIGONG WAS FORCED TO GIVE HER UP. GINA A SHOO-IN FOR THE SENATE NEXT ELECTIONS. Nominated DENR Secretary Gina Lopez at this afternoon's CA confirmation hearing, which she failed to survive politically. No Secretary of Environment and Natural Resources (DENR) has ever faced the 24-member Commission on Appointments (CA) as controversially, with super-strong lobbying for and against the nominee, than the feisty straight-talking Regina "Gina" Lopez of the family that owns the ABS-CBN Network. 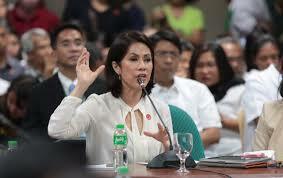 This afternoon's deliberation on Gina was the second before the CA, as she was initially rejected by it weeks back. President Duterte re-nominated her and until this afternoon no one could second-guess the result of the voting conducted by the Senate Committee on Environment and Natural Resources, chaired by Sen. Manny Pacquiao. Today's CA hearing was closely watched as the rules provide that after a second rejection, the nominee WOULD BE OUT---NO MORE RE-APPOINTMENT by the Chief Executive. 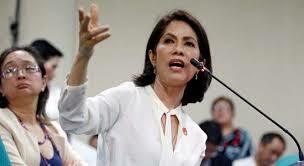 It was make or break for Gina Lopez. It was pandemonium outside the Senate with the incredible show of support to Gina by various environmental advocate groups, including those from the Left (a clear case of halo-halo ideologies). Frankly I had wondered who among the 12 senators and 12 representatives would have the guts to reject this bromide-spouting DENR appointee---considering that her influential family, with its powerful multi-media network and other corporations, including Meralco, could make or unmake political fortunes. I myself had doubted if the CA members could really withstand the lobby pressures from her associates and cause-oriented sympathizers. But DEFY THOSE PRESSURES the CA members did this afternoon in a STUNNING 16 against and 8 pro vote. It’s a most commendable show of independence by the CA members. The Chamber of Mines that comprises corporations excavating our minerals from the belly of the earth and marketing them globally fought against Gina as it had never fought before. The Duterte Cabinet was also torn apart, but increasingly the group led by Finance Secretary Carlos Dominguez prevailed over their left-wing colleagues. Dominguez's punch-line: that Gina Lopez ought to remain a terrific crusader for the environment, but she shouldn’t be DENR Secretary as this post demands a BALANCED APPROACH toward care and custody of the environment, on the one hand, and fostering the economy and livelihood on the other. Dominguez's argument gained traction as the dragon lady of the environment began spitting more fire and uttering things better left unsaid. One such assertion is that as Secretary she will ask the help of the NPAs in the provinces to carry out the care of the environment. I imagine that statement spooked the military and the politicians as well. In the battle for Gina’s confirmation in the CA, media forces were clearly divided, some pushing for her confirmation while many more were outright against her. As the weeks drew on and Gina started appearing more strident and one-track minded, many more media came out openly against her. The Chamber of Mines also painted a dark picture of a plunging PH economy due to near-standstill exports of minerals, should Gina be confirmed. Its members were particularly incensed after Lopez ordered an audit of various mining firms and then closed 23 of them without furnishing them a copy of the audit report. As Gina Lopez twisted in the CA, the mining industry did some soul-searching, which was good. The question was raised that we need to ask ourselves as Filipinos: how come other countries have become rich and prosperous and attained near-First World status, e.g., Australia, Canada and Brazil, on the strength of the mining industry, among other factors? The next question is, how did those countries strike the balance between conservation of the environment and precious natural resources, and pushing the economy as well with mining revenues? The question all patriotic Filipinos should ask themselves is: Did God endow our country with such mineral wealth (we're the richest in nickel and among the top producers of iron ore, and we have lots of gold) only for us to bury them forever as reserve assets. I SAY NO, LET'S MINE THESE PRECIOUS MINERAL WEALTH WITH DISCRIMINATION AND CARE, SO THAT THESE COULD BE PROFITABLE FOR FILIPINOS THROUGH THE GENERATIONS. Chamber of Mines Chief Artemio Disini points out that the industry employs over 200,00 people and mining taxes paid yearly amount to around P889 million annually, or 1.21 % of gross sales. Roughly 17-18% of our gross income comes from mining, Disini asserts, but Gina counter-argues that it’s only .04 % . Dr. Carlo Arcilla, Ph.D. chief of the UP Geological Institute and trained in the University of Chicago where he taught for ten years, argues on the other hand that mining companies "go where the government doesn’t": e.g., they build roads, schools, housing, etc., and that the 'common good' does not exclude people.” Dr. Arcilla further asserts that the trouble is that “some people find sins in mining that are not its sins.” To which Gina Lopez retorts, reminding us about mining that pillages communities, “if our people suffer, then it cannot be good for us." After succeeding in blocking Lopez's appointment, it behooves the Chamber of Mines to deliver and improve its performance in protecting the environment that's still reeling from the abuses of irresponsible miners in the past. THE MEMORY OF CALANCAN BAY IN MARINDUQUE, DESTROYED PERHAPS FOREVER BY TAILINGS FROM A MINING COMPANY THERE IN THE MARCOS YEARS, REMAINS FRESH. Then too, it's good to remember that out of 13 provinces where mining is active, 10 of them REMAIN BELOW THE POVERTY LINE. The Chamber must look into this continuing tragedy amid the plentiful minerals in the earth's belly and unscrupulous exploiters. Personally I was against confirmation of Gina Lopez as I thought she's too one-track minded against mining--- whereas her post demands both protection of our environment AND responsible extraction of our minerals to provide livelihood for our people. I thought there'd be no end to the debates on mining’s effects on the environment if Gina were appointed, as she's armed with A NATURALLY ADVERSARIAL STANCE vs. the mining companies. Her behavior at times also worries folks about her being a bit loony. Now that the Chamber of Mines' stand on Lopez was heard by the CA, the mining officials should prevail on all its members to act responsibly to protect the environment. Away from mining companies that blacken its name (being whispered about in corridors is the tendency of some foreign-operated companies to throw out the rules). . The hearty debates on pros and cons of mining unite on one reality: the crying need to lift the great masses of our people from poverty.